31 January 2019: — Поздравления Борис! The Alpha/Beta Society, an informal group of members who have made outstanding contributions to the development of the lead acid battery system, appointed Boris Monahov as its 26th member on January 28. 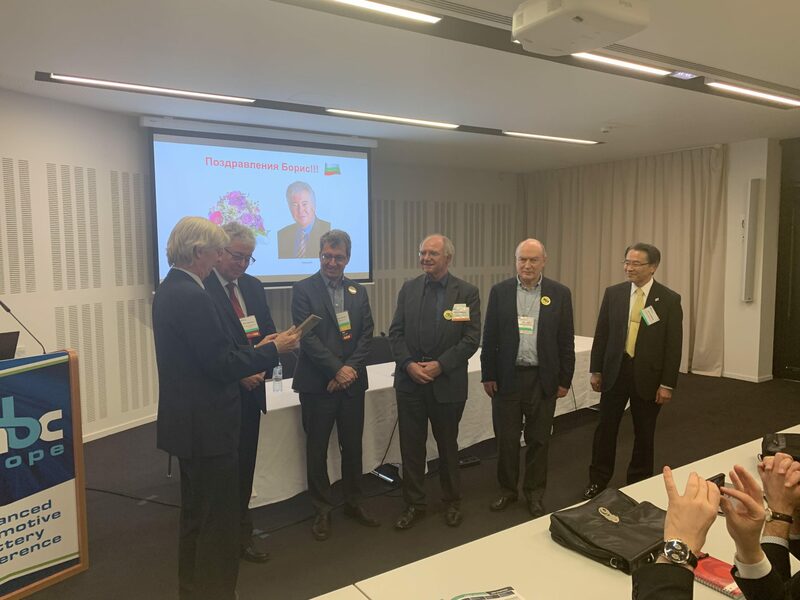 Speaking at a special ceremony on the sidelines of the AABC meetings in Strasbourg, Juergen Garche, grand master of the society, welcomed Monahov as a member. “Boris has had a long and highly impressive career spanning four decades of work in lead battery research, it is only right that his achievements be recognized in this fashion,” he said. Monahov paid tribute to his mentor and friend Detchko Pavlov — the fourth member of the society — who died two years ago. Monahov also thanked the selecting panel of the members for their endorsement. The society was launched in 1989 by David Rand (CSIRO) and Ernst Voss (Varta) at the first Labat conference in Bulgaria. Typically the society appoints one new member a year. In recent years Jun Furukuwa, Eckhard Karden and Allan Cooper have been added to its ranks.